As a rule, in the attic floors, bedrooms, baby rooms, rarely cabinets or living rooms are placed. Initially it was planned to place the library in this large room. 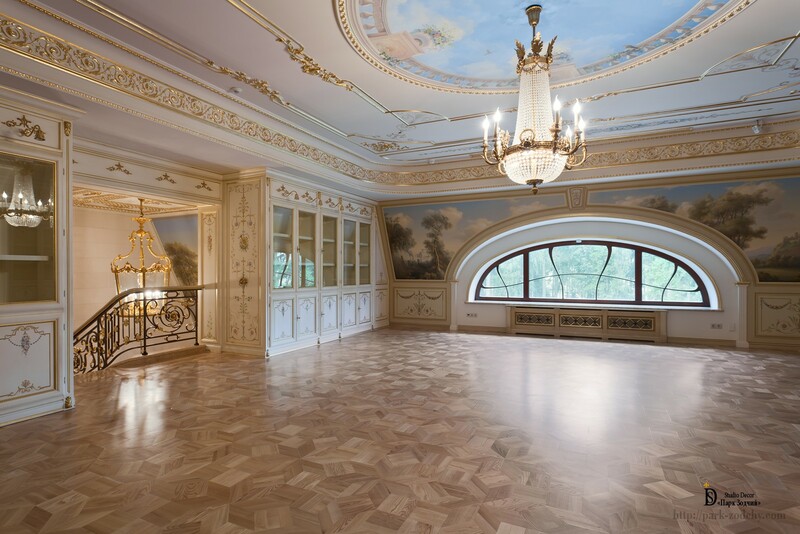 However, as time passed, the attic floor had become multi-functional, this was facilitated by the Classic-style décor, Trompe l’oeil mural paintings and the room’s equipment, being so masterfully turned into advantage. Attic rooms may rarely boast of sufficient height and correct forms so that it could be possible to build the Classic-style Interior, that corresponds to the classical canons. However, decoration of the hall of the upper floor should not lead from the general concept of decoration of the home. So it has been decided to use light colors and rich experience of masters of the past. Layout of the parquet is monochrome, since the pattern could be lost in small space. 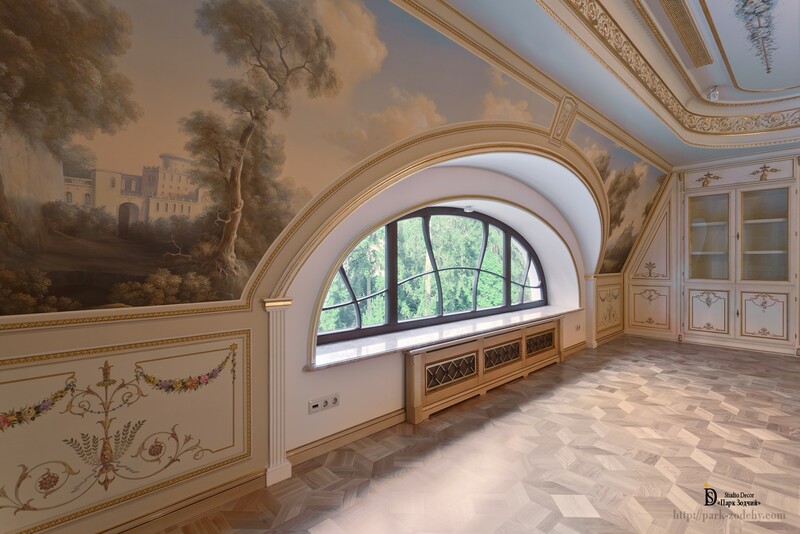 Different types of mural paintings, stucco moldings complement each other and perform exactly those functions that are needed in this room. The cabinets are decorated with fine gilded elements and ornamental grisaille mural paintings, magnificent in their elegance, that echoes the decoration of wall panels. An interesting feature: the cabinets are equipped with extra lighting fixtures so that it could be easily to find necessary books. In addition, they give some additional soft backlighting and the angles do not look gloomy. 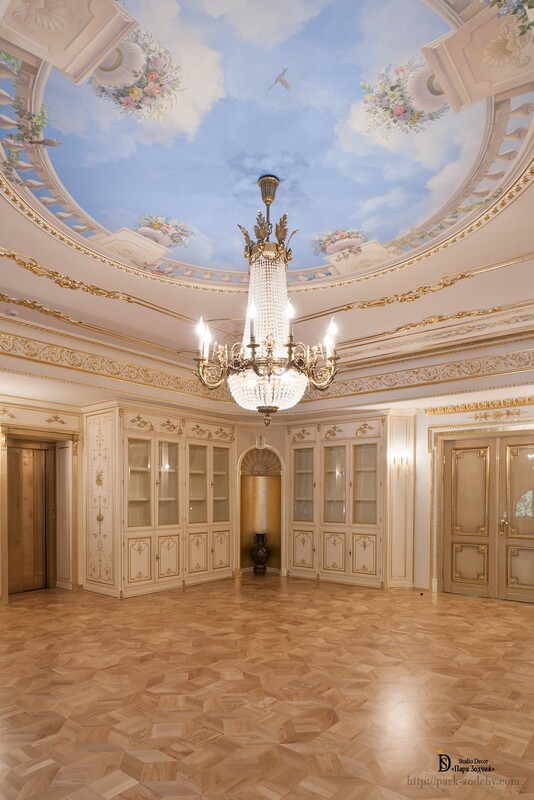 Wall panels, ceiling mirror and bookcases in the hall decorated with ornamental grisaille mural paintings. Illusionistic Trompe l’oeil mural painting of the plafond is performed so skillfully that sense of a closed space is lost, small porticoes as if frame the blue sky. The ceiling visually disappears, and thus the view of the ceiling height changes. This is facilitated by perfectly matched and performed stucco moldings with radial corners. Fine, weightless elements decorate, but do not create the effect of overhanging in the low room, the same as shining gilded cornice with floral motifs. 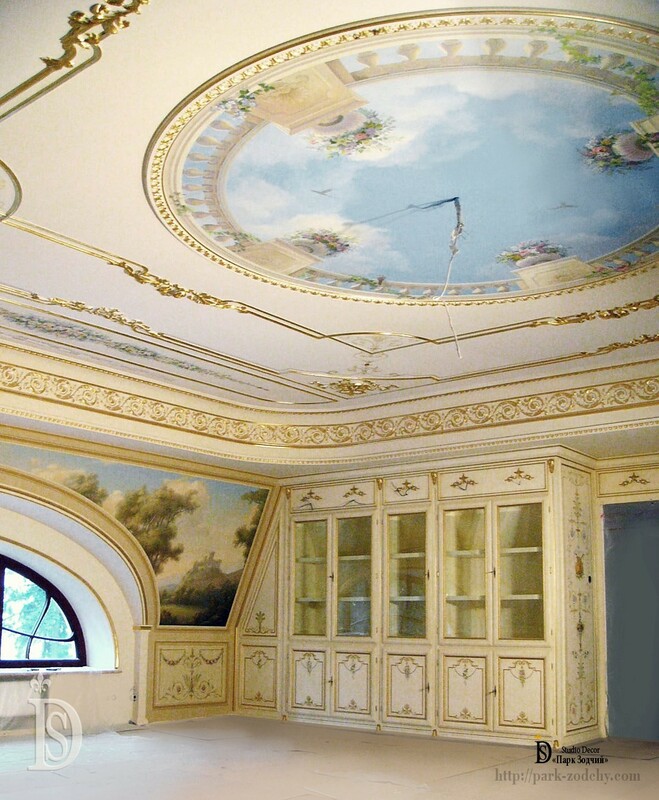 Spatial Trompe l’oeil ceiling murals on the wall with the window has not become an ordinary art object. Illusionistic compositions are not placed in front of the window, only in this case they acquire the necessary depth and are perceived as a three-dimensional panorama. As a result, the painting’s theme of nature gently flows into the landscape outside the window. However, it has served for one more goal: concealed the overhang walls above the window, thus has covered up the shortcoming of the room. Despite the fact that the room has preserved the features and furniture of a library, that was intended by the initial layout, in whole, the Interior has turned out elegant and very pretty, that has made it multi-functional.